Most regard the king as divine - but is he infallible? Three months after King Gyanendra seized political power in Nepal, and nearly four years after the royal massacre which dented the aura of the monarchy, many Nepalese still consider their king to have divine powers, as an incarnation of the Hindu god Vishnu. But does this persuade them to support his political actions? In the temple at Budhanilkantha, near Kathmandu, devotion to Vishnu is palpable. As a clangour of bells - with a squealing clarinet - erupts, priests offer a morning prayer to an image of great serenity: a giant statue of Vishnu, asleep in a pond on the coils of a snake, his protector. Pilgrims queue, crushed together, to pay homage. 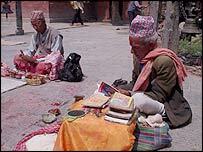 They offer the sleeping Vishnu incense, rice, flowers; the smell of camphor fills the air. 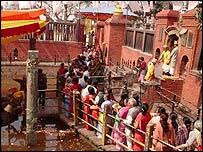 But, my guide Kailash Maharjan tells me, there is a tradition that kings of Nepal must never visit this temple. If they do, they will die or be chased away by the serpent. Since the belief arose "in maybe the fourth or fifth century, no king has come here". Legend says this is because the king is an incarnation of Vishnu and must not see this image of himself. In conversations with pilgrims here, everyone identified the king with Vishnu, who in the great Hindu triumvirate of gods is the preserver and nurturer. "Vishnu looks after the people," says a female student. "He will take care of them, giving food, shelter, love - everything. "The king is the same. He loves us, cares for us. He is the Vishnu for us. It's related." Sudhindra Sharma, a Nepalese expert on religion, says there is nothing in the Hindu scriptures that links monarchs to Vishnu's 10 traditional incarnations. But they do say kings contain portions of deities, and Mr Sharma says Nepalis have linked Vishnu and their kings for nearly 2,000 years. He quotes a Nepali saying: if the king could hear what's going on, he would do something about it; if the gods could see what's going on, they would do something about it. "For the population at large, the idea that the king should act is pervasive," Mr Sharma says. 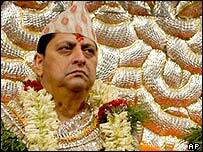 The devout King Gyanendra is on record as saying he is a pragmatic person, not a god. But he may sense that some people, believing in his divinity, may be more inclined to support him. For the ardent monarchist, honorary aide-de-camp to the king, retired general Bharat Kesher Simha, King Gyanendra can do no wrong. "It's the divine power, he has got it," he insists. "Why didn't I become a king? Why did he become a king? "Unless you have some power given to you by the god, you cannot be a king. He is courageous, he is bold, he is wise." 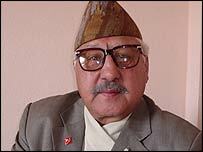 He says a Hindu king must protect his people and that, given the conflict with Maoists, he himself urged King Gyanendra to take firm political action. Gen Simha is president of the World Hindu Federation, an international body based in Nepal aiming at Hindu pre-eminence worldwide. They regard the Nepalese king as emperor of all Hindus. India's powerful right-wing Hindutva organisations, a force behind the government till a year ago, adore this idea. Mr Sharma says it suits the politics of both them and the king. For the Hindu right, this monarch embodies a Hindu tradition lost in India. For the king, the Hindutvas are a reliable constituency in Indo-Nepali relations. But, he adds, it "could be very problematic" for King Gyanendra to get too close to some of these organisations, such as India's Vishwa Hindu Parishad (VHP) or World Hindu Council, with its hardline, anti-secular views. In its limited Nepali lifespan, democracy has never mixed religion with politics. Many Nepalis nowadays, especially if you talk to them away from the temple environment, laugh when you ask if they regard the king as Vishnu. Even in the Vishnu temple at Budhanilkantha, most of those who do see the king as divine judge his political actions separately. "I'm not in favour of the king's [takeover]," says one Nepali man. "It's against the people and the constitution of Nepal." "Political and religious things are very different," says a student, firmly. "It is not believed that due to his divine virtue he is doing right or wrong." For many across the Hindu world, then, Nepal has a god-king. But that does not make him infallible.